It feels like many people are lamenting the weather and pining for an early spring. While I definitely sympathise with the sentiment, there is something lovely and relaxing about grim weather. There is less expectation to leave the house and the cozy, “hygge” atmosphere would be ruined by glorious, vitamin D giving sunshine. We would feel guilty about eating lovely, steamy stews and soups instead of bikini-loving avocado toasts and egg-white-only omelettes. 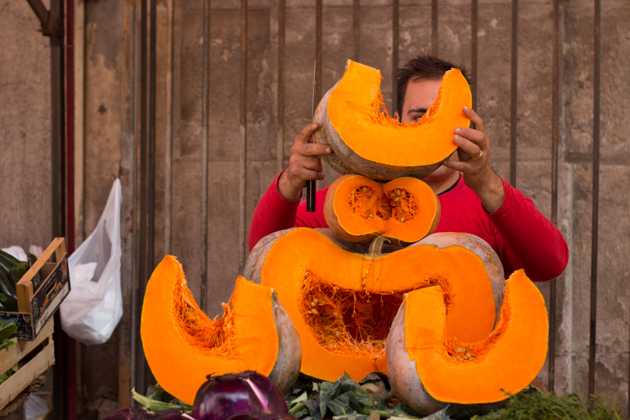 Plus there are pumpkins of every shape and colour with their sweet flesh married with crushed amaretti, butter and sage, sweet and sour, garlic, mint, basil or even stuffed with meat and pecorino cheese. While I love the traditional gnocchi made from potatoes, I am happy to eat this year-round. 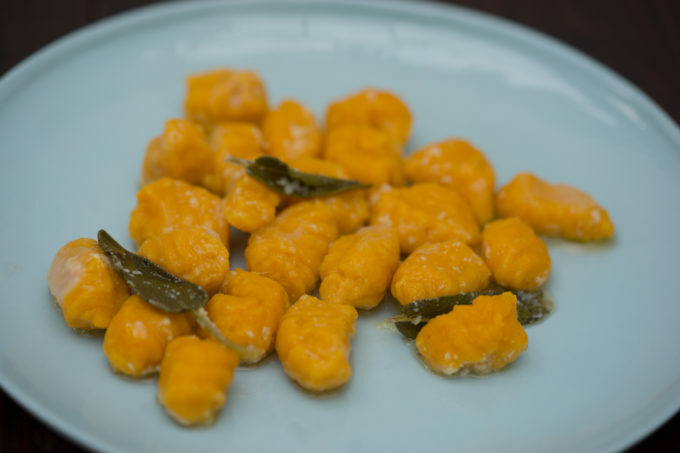 This season though, I like to make pumpkin gnocchi and toss them in sage infused butter. I sometimes also make gnocchi with a mixture of pumpkin, chestnut flour and potatoes as they do in Val d’Ossola in Piedmont. I also sometimes substitute the flour and breadcrumbs for polenta to add an extra nutty flavour and make them gluten free for friends. I’ll be back with this recipe soon but today I want to share with you my recipe for pumpkin gnocchi. 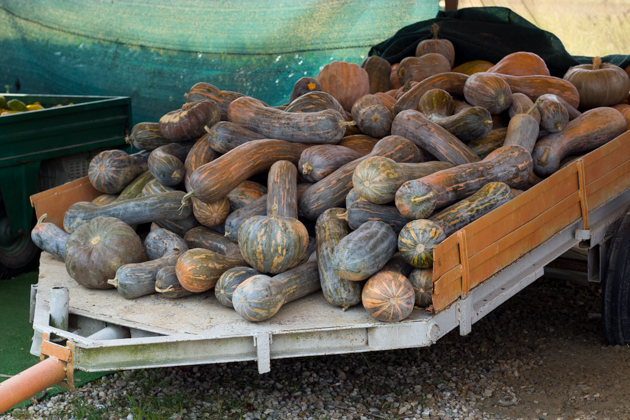 Pumpkin gnocchi are common in the north of Italy, particularly Lombardy. Crushed amaretti can be used to substitute some of the flour as they would do in Cremona. Instead of sage, a crushed garlic clove and a branch of rosemary may be added to the butter as it would be cooked in Brescia. In Friuli, some cheese would be added to the gnocchi dough and they would be baked al gratin in the oven with breadcrumbs, cheese, malted butter and sage. The key to this recipe is keeping the gnocchi light and this is achieved by adding as little flour as possible and removing moisture from the potatoes and pumpkin by cooking them in the oven. Roasting also concentrates the flavours of the pumpkin and potato and none of the nutrients are lost as they would be if they were boiled. If you want to add crushed amaretti biscuits to the gnocchi, add 10 to 20 grams (depending on your taste) to the dough and deduct and equivalent amount of flour. Preheat the oven to 180C. 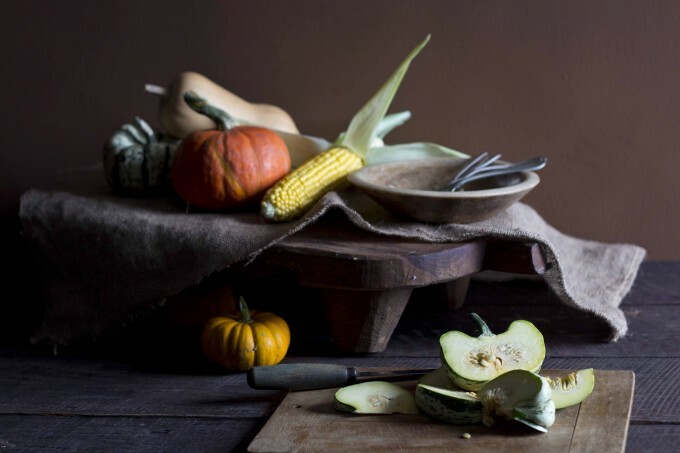 Grease a baking sheet with a neutral flavoured oil and add the diced pumpkin. Bake the pumpkin for 30 minutes until soft. You should end up with 360 grams of pumpkin. At the same time, prick the potatoes all over with a fork and bake them on a greased baking tray for an hour or until soft. When cool enough to handle, remove the skin. You should end up with 360 grams of potato. Puree the pumpkin and the potato together either using a ricer, food mill or masher. Add 10 grams of the butter, the egg, flour, nutmeg and salt to taste. Gently mix the ingredients together using your hands to make sure it is well mixed. Be careful not to overmix as you do not want to form gluten strands which will toughen the gnocchi. Flour a work surface (preferably wood) and flour your hands. Break off a piece of the dough and roll it into a cylinder about 1.5 cm in diameter. Cut into pieces about 2 cm in length. Roll the pieces down a floured, wooden grooved board or off the back of a fork’s tines to form grooves in the surface of the gnocchi. These grooves will hold the sauce. Bring a large pot of salted water to boil and add the gnocchi to the water. Cook until they float. You may need to give a little stir in case any are stuck to the bottom. Meanwhile, heat a large frying pan over medium heat with the butter and sage in it. When the butter has melted, let the sage cook for 1 minute and turn off the heat. As the gnocchi float, remove the floating gnocchi using a slotted spoon and place in the saucepan with the butter and sage. Toss to coat the gnocchi and cook for 2 more minutes. Serve with grated Grana Padano cheese.